Here at Best Mattress, we believe that you have to try out a mattress to really understand whether or not it will work for you. To help our customers to gain this valuable insight, we have expanded across Nevada and Utah, offering 21 locations throughout Las Vegas, Mesquite, and St. George. Unlike other mattress warehouses, we maintain a strict commitment to quality. We don’t carry lower-end brands just to offer rock-bottom price points, because we know that our customers would be disappointed. Here are just a few of the top-notch brands we carry: Serta, Beautyrest, & Tempur-Pedic. Also, to make finding the information you need even easier, we update our website regularly to list current specials, product information, and pricing. If you can’t make it into the showroom, feel free to call us at 702-407-0444. Any of our employees would be more than happy to assist you. We understand that it can be hard to make time in your busy schedule to shop for mattresses, which is why we are open later than most other mattress stores. 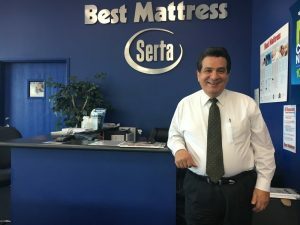 Best Mattress Showroom and Clearance Center 7220 Dean Martin Dr. #100, Las Vegas, NV 89118. The easiest way to get to our Dean Martin Drive location is to look for the intersection between Warm Springs Road and Dean Martin Drive. We are right behind Piper Plastics. We are eager to talk with you and help you find the best mattress you’ve ever had. Silver is a passionate sales person with all the drive to get each customer the Best product at the Best price! He is a sleep expert that specializes in Serta, Simmons, Tempur-Pedic, Sherwood & Five-Star brands. He knows all the details about Simmons products. Whether you are looking for a BeautyRest Black, Silver or Platinum, he is the guy. Serta’s Perfect Sleeper & iComfort definitely fall within his expertise. He can pair any brand with the adjustable base of your dreams at a low price with all the protective accessories that make your sleep the Best! At the Best Mattress we offer you the best selection of mattresses which guarantee to meet your sleep style, whether you prefer a soft or firm mattress, or you are a back sleeper, stomach sleeper or a side sleeper. Our store manager, Dana DeBerardi, will make sure that you are met with the best service in the industry. You don’t have to take our word for it. We are proud to encourage our potential customers to visit our Facebook Page and read customer reviews. We also maintain our social media pages to let our customers know about manager specials and other great specials. Follow us today!